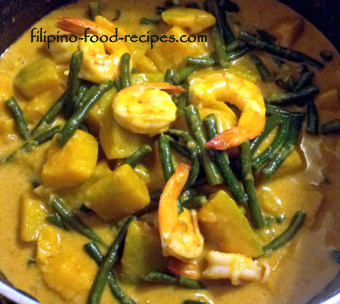 Ginataan Kalabasa with Sitaw is a rich, thick vegetable dish of squash and string beans, made creamy by coconut milk. The dish is slightly sweet because of the squash, the kind which has a deep yellow flesh and rich sweet flavor when cooked. If you live in the Philippines, this variety is most probably the only one you will find. However, outside the PI, you might find one that looks like this, but bland and not sweet once cooked. Also, most are called or popularly known as pumpkins, instead of squash. Some people prefer the dish without the string beans, though the beans gives it a contrasting texture from the soft squash. Also, the meat ingredient depends on the cook's preference. The popular choice is seafoods such as shrimp or crabs, but pork and beef may also be used. Chicken, on the other hand, is taboo, as there is an old wives tale that one can contract a disease if one eats squash with chicken. My mom heard it from my grandma, so mom would rather not have any meat at all than serve squash with chicken. Though I cannot find any merit or foundation to the belief, I don't have a problem with that since my preference has always been shrimp when cooking with squash. 1 Pan-fry the shrimps in little oil for about 30 seconds per side, then set aside. 2 Using the same pan and oil, saute the garlic, onion and chili pepper, then add the shrimp paste. 3 Add the squash and string beans and cook for a minute. 4 Pour in the coconut milk and shrimp broth, bring to a boil. 5 Turn heat down and simmer for 10 - 15 minutes, or until the vegetables are tender. 6 Add the coconut cream to thicken the sauce and cook for a few minutes. 7 Put in the cooked shrimps and season with salt(if needed) and pepper. 8 Serve hot with rice. You can cook whole shrimps (with shells and all) and skip the making of shrimp broth. Make sure to cook the shrimp briefly and not at the same time as the veggies or they will be tough and rubbery. 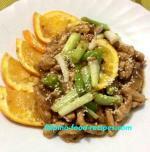 I like my Ginataan Kalabasa where the squash is almost mushy and the sauce is thick, but that's a personal preference. Cook your veggies up to the stage that you like them. 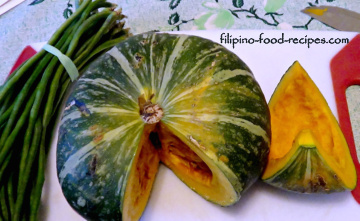 Add a pinch of sugar if your squash is not sweet enough for your taste. Also, you may want to add some cornstarch dissolved in little water if your don't have coconut cream or your sauce is not thick enough.